National Hardware Door Roller, Series: V7602, Heavy Duty, Long Stem, 1-7/8 in Roller Diameter, 0.44 in Roller Width, 10 Ball Bearing, 7-9/16 in Overall Length, Plain Steel, 7/16 in Shaft Used on side by side hinge placements for added strength. Factory lubricated, steel inner race with 10 ball bearings. Roller 1-7/8" O.D. Heavy-duty galvanized steel pulley used at stationary or spring positions. Galvanized steel strap and case hardened steel race with steel ball bearings. Factory lubricated. Includes pulley, strap, and axle bolt with nut. Heavy-duty galvanized steel lever mechanism to disengage side latches. It accepts a 5/16" square shaft locking handle and fits Frantz and other garage doors. National Hardware Door Roller, Series: V7602, Heavy Duty, Suitable For Use With: Residential Garage Doors, 1-7/8 in Roller Diameter, 10 Ball Bearing, 4-3/8 in Overall Length, Plain Steel, 7/16 in Shaft Short stem heavy-duty roller with steel inner race; 10 ball bearings. Contents: 2 roller assemblies. Roller 1-7/8" O.D. National Hardware Door Pulley, Series: N280, 3 in Sheave Width, Steel, Galvanized, Includes: Fork, Axle Bolt and Nut, Standards: BHMA A138.18, For Residential Extension Spring Doors Visual-pack. Galvanized carbon steel aircraft cable used on 7'H torsion spring doors. National Hardware Side Lock, Series: V7647, 7-1/2 in Overall Width, Steel, Zinc Plated National Hardware Extension Spring Lift Cable, Series: N280, 3/32 in Cable Diameter, 12 ft Cable Length, Steel Cable, Galvanized Body Finish/Color, Standards: BHMA A138.18, For 7 ft Single or Double Wood or Metal Doors Designed for use with No.GD-52147 outside lock and latch assembly. Galvanized steel, spring-loaded lock with latch bolt release lever. 1-3/4" Nylon roller, 4-1/2" stem, 7/16" steel shaft. Visual-pack. Galvanized carbon steel aircraft cable installs through extension springs to prevent injury in case of breakage. Required on California installations. Use 4 cables for dual spring doors. Works only from inside for extra protection as a night or vacation security lock. Fits most garage doors. Engages slot in vertical track. 7/8"W x 1/8" thick steel slide bolt with heavy-duty galvanized steel housing. Includes lock assembly and four 1/4"-20 x 1-7/8" pancake-head carriage bolts with nuts. 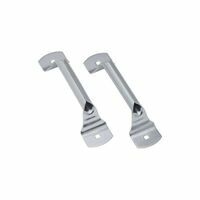 National Hardware Locking L-Handle, Series: V7641, Universal, Suitable For Use With: Model 7645 Swivel Lock/7654 Snap Lock, Die-Cast Handle, Steel Shaft, Chrome, 5/16 sq-in x 3-11/16 in Shaft, For Wood or Metal Garage Doors, Camper Tops, RVs National Hardware Blank T-Handle, Series: V7639, Die-Cast Handle, Steel Shaft, Chrome Plated, Includes: (1) 1/8 in Dia x 5/8 in Length Knurled Pin, (2) 2 Push Retainer For 0.309 sq Shaft, (3) Flat Washer 7/16 in ID and (4) NO 7 x 1 Oval Head Slotted Screws, 5/16 in Dia x 3 in Length Shaft Hard-drawn wire rods, the only tool used to wind and unwind tension on torsion springs. National Hardware Locking T-Handle, Series: V7643, Suitable For Use With: Model 7645 Swivel Lock/7654 Snap Lock, 2 Keys, Die Cast Handle, Steel Shaft, Chrome, Includes: (2) NO 10 x 3/4 Phillips Pan Head Machine Screws and (1) Retainer Washer, 5/16 sq-in x 3-3/4 in Shaft, For Metal or Fiberglass Doors Used when locking cylinder is mounted separately. 1-1/2" hole centers. Includes 1 die-cast outside handle with 5/16" square x 3"L shaft, and 1 die-cast zinc inside handle with set screw. 5/16" square shaft, 3"L, replaces most garage door, camper and RV locking handles. Zinc die-cast construction. 1-1/2" hole centers. Includes locking handle and 2 chrome plated solid brass keys. 5/16" square shaft, 2-7/8"L, replaces most garage door, camper and RV locking handles. Zinc die-cast construction. 1-3/4" hole centers. Includes locking handle and 2 chrome plated solid brass keys. Color: Black. Boxed. For use on sectional, overhead, single car fiberglass doors. Use two 70lb springs for each 70lb door (1 on each side). Rated at 10,000 cycles. Includes safety cable, which protects against personal injury and property damage from broken springs. Color-coded and shrink-wrapped for selection ease. Polybagged. Replacement springs for use with garage door hardware assemblies. Plug end type. Connector included. Two P928C springs can support up to 75 LBS. Two P728C, P730C, or P732C springs can support 90 to 150 LBS. Two P528C, P530C, or P532C springs can support 105 to 175 LBS. Two P328C springs can support 125 to 250 LBS. National Hardware Extension Spring, Series: 7690, 25 in Nominal, 130 lb Load Capacity, Steel, Black, For 7 ft High Garage Doors Replacement springs for use with garage door hardware assemblies. Plug end type. Connector included. Two P928C springs can support up to 75 LBS. Two P728C, P730C, or P732C springs can support 90 to 150 LBS. Two P528C, P530C, or P532C springs can support 105 to 175 LBS. Two P328C springs can support 125 to 250 LBS. National Hardware Extension Spring, Series: 7691, 22 in Nominal, 150 lb Load Capacity, Steel, Black, For 7 ft High Garage Doors For use on sectional, overhead, wood doors 8'W x up to 6'6"H, 2 panel/4 section; or fiberglass doors 16'W x up to 7'H, 4 section. Use two 110lb springs for each 110lb door (1 on each side). Rated at 10,000 cycles. Includes safety cable, which protects against personal injury and property damage from broken springs. Color-coded and shrink-wrapped for selection ease. Polybagged. Allows operation of garage door opener without a transmitter; mount to the exterior door jamb and hard wire to opener. Contents: 1 key cylinder with plastic housing and face plate assembly; 2 keys. For use on sectional, overhead, wood doors 9'W x up to 7'H, 2 panel/4 section; or wood doors 16'W x up to 7'H, 2 panel/4 section. Use two 140lb springs for each 9'W 140lb door (1 each side); use 4 springs for each 16'W 140lb door (2 on each side). Rated at 10,000 cycles. Includes safety cable, which protects against personal injury and property damage from broken springs. Color-coded and shrink-wrapped for selection ease. Polybagged. Replacement springs for use with garage door hardware assemblies. Plug end type. Connector included. Two P928C springs can support up to 75 LBS. Two P728C, P730C, or P732C springs can support 90 to 150 LBS. Two P528C, P530C, or P532C springs can support 105 to 175 LBS. Two P328C springs can support 125 to 250 LBS. Replacement springs for use with garage door hardware assemblies. Spring latch end type. Connector included. Two SL728C, SL730C, or SL732C springs can support 90 to 150 LBS. Replacement springs for use with garage door hardware assemblies. Spring latch end type. Connector included. Two SL728C, SL730C, or SL732C springs can support 90 to 150 LBS. Replacement springs for use with garage door hardware assemblies. Plug end type. Connector included. Two P928C springs can support up to 75 LBS. Two P728C, P730C, or P732C springs can support 90 to 150 LBS. Two P528C, P530C, or P532C springs can support 105 to 175 LBS. Two P328C springs can support 125 to 250 LBS. Replacement springs for use with garage door hardware assemblies. Plug end type. Connector included. Two P928C springs can support up to 75 LBS. Two P728C, P730C, or P732C springs can support 90 to 150 LBS. Two P528C, P530C, or P532C springs can support 105 to 175 LBS. Two P328C springs can support 125 to 250 LBS. For use on sectional, overhead, wood doors 9'W x 7'H, 4 panel/4 section; or wood doors 16'W x 7'H, 4 panel/4 section. Use two 150lb springs for each 9'W 150lb door (1 each side); use 4 springs for each 16'W 150lb door (2 on each side). Rated at 10,000 cycles. Includes safety cable, which protects against personal injury and property damage from broken springs. Color-coded and shrink-wrapped for selection ease. Polybagged. 5/16" square shaft, 3-1/8"L, will work with No.GD-52138 side lock. Die-cast zinc handle and housing. Includes handle, housing, cylinder lock with break-off spindle, 2 chrome plated solid brass keys, and set of installation screws. Replacement springs for use with garage door hardware assemblies. Plug end type. Connector included. Two P928C springs can support up to 75 LBS. Two P728C, P730C, or P732C springs can support 90 to 150 LBS. Two P528C, P530C, or P532C springs can support 105 to 175 LBS. Two P328C springs can support 125 to 250 LBS. For use on sectional, overhead, wood doors 9'W x 7'H, 4 panel/4 section; or wood doors 16'W x 7'H, 4 panel/4 section. Use two 160lb springs for each 9'W 160lb door (one each side); use four springs for each 16'W 160lb door (2 on each side). Rated at 10,000 cycles. Includes safety cable, which protects against personal injury and property damage from broken springs. Color-coded and shrink-wrapped for selection ease. Polybagged. Replacement springs for use with garage door hardware assemblies. Plug end type. Connector included. Two P928C springs can support up to 75 LBS. Two P728C, P730C, or P732C springs can support 90 to 150 LBS. Two P528C, P530C, or P532C springs can support 105 to 175 LBS. Two P328C springs can support 125 to 250 LBS. Includes: 8' chain/cable assembly, Rope, Master Link Kit, and 2 Rail Clips. Replacement springs for use with garage door hardware assemblies. Plug end type. Connector included. Two P928C springs can support up to 75 LBS. Two P728C, P730C, or P732C springs can support 90 to 150 LBS. Two P528C, P530C, or P532C springs can support 105 to 175 LBS. Two P328C springs can support 125 to 250 LBS. Boxed. Boxed. Use to replace torsion springs. Mounts to header directly above door. Requires 2 winding rods (No.52238 sold separately). Includes spring with winding cone and anchor cone attached. Color-coded for selection ease. Use to replace torsion springs. Mounts to header directly above door. Requires 2 winding rods (No.52238 sold separately). Includes spring with winding cone and anchor cone attached. Color-coded for selection ease. Use to replace torsion springs. Mounts to header directly above door. Requires 2 winding rods (No.52238 sold separately). Includes spring with winding cone and anchor cone attached. Color-coded for selection ease. Boxed. Boxed. Use to replace torsion springs. Mounts to header directly above door. Requires 2 winding rods (No.52238 sold separately). Includes spring with winding cone and anchor cone attached. Color-coded for selection ease. Use to replace torsion springs. Mounts to header directly above door. Requires 2 winding rods (No.52238 sold separately). Includes spring with winding cone and anchor cone attached. Color-coded for selection ease. Replacement springs for use with garage door hardware assemblies. Clip end type. Connector included. Two C128C springs can support 300 LBS. Includes: 8' chain/cable assembly, Rope, Master Link Kit, and 2 Rail Clips.